I have lived in various cities throughout the United States, and have traveled many countries around the world, but have come back home to open up the first stage of my lifelong dream….to feed the many wonderful people of Cleveland the food of my Greek heritage. 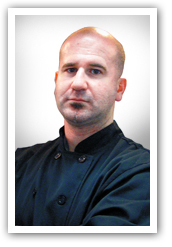 I have cooked in many various kitchens and restaurants for over 20 years. I have also owned various themed restaurants in the Cleveland area over the last decade. Finally this year, though, I have opened my first Greek eatery… one of many that are in my future plans. Greek Village Grille is an authentic Greek gyro sandwich shop, as those found throughout Greece. I have taken the best foods from the many Greek “gyradika” (gyro shops) and brought them here to you. I have gone, though, one step beyond and kept the authentic recipes. Everything is home-made and prepared with passion, and it brings me pleasure and happiness to be able to serve you my creations. Greek Village Grille serves only Greek food, and will always keep its authenticity to traditional Greek food. I believe in quality, cleanliness, freshness, and affordability. These are the qualities that I was trained in and these are the qualities that I personally believe in and will always keep in my shop. So welcome to my Greek Village and Kalh Sas Oreksi (Good Appetite)!